Wildcat Mountain Trails. 10-12? miles. Trail head is south of Lake Sylvia at 34.84623, -92.817855. USFS info. 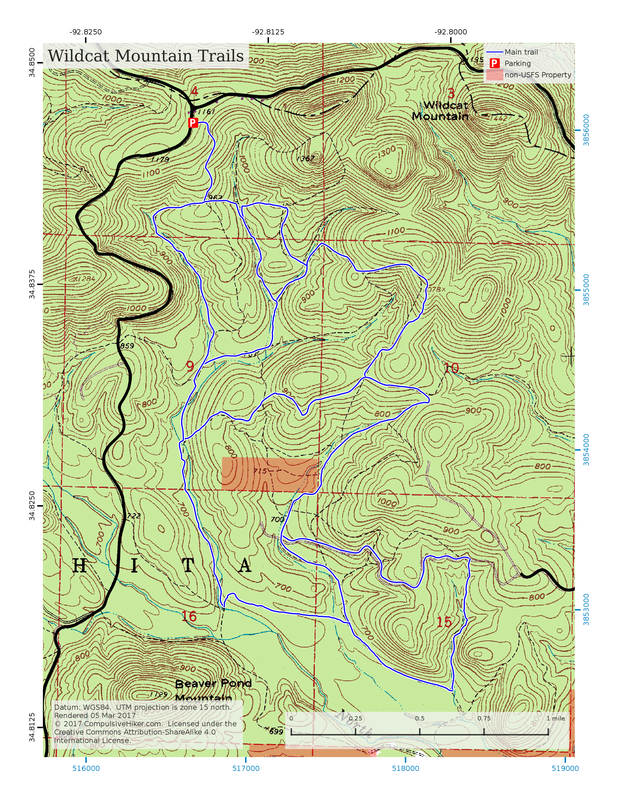 The trails are on old logging roads, and there are a few more roads than are shown on the map. Partially blazed and not well marked. Though open to mountain bikes, a couple areas have become so brushy or have so many down trees that they probably wouldn’t be much fun on a bike. Jan ’15 trip report, Mar ’17 trip report. Mar ’17 update: the tornado damage observed during my Jan ’15 trip has been cleared. A map of the “interior” trails. There are 2 or 3 paths leading outside that I haven’t explored yet. Click on the image to get it full-size. Every time I update the map the image will have a different name so if you want to bookmark or share the map, link to this page – not the image. Will print at 1:18000 scale on 8.5×11 paper. Added a few additional trails. Added marking of area roads. Re-scaled to 1:18000 on 8.5×11 paper. I’ve changed the styles to be consistent with my other maps. Added some track data (rendered in purple) that I haven’t personally hiked and verified, but I think it’s probably there. A chunk of private property in the middle of all this is now noted with a translucent red overlay. I kinda remember it being fenced and pretty noticeable.